68809 ENT AUSTRIA (1931) Bridge across Styre river*. Illustrated postal card (O). 68892 OBL FRANCE (1950) Bridge over Yonne river at Villeneuve. 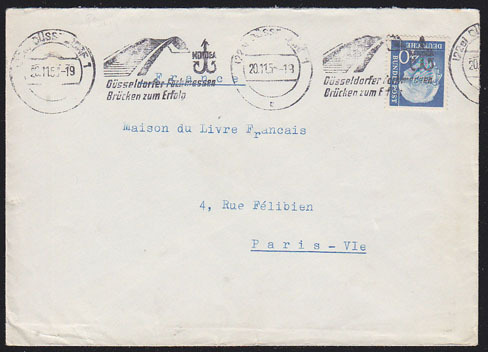 Nice pictorial cancel on envelope. 68897 OBL FRANCE (1953) Bridge over Saone river at Chalon-Sur-Saone. 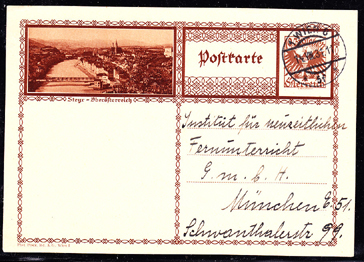 Nice pictorial cancel on envelope. 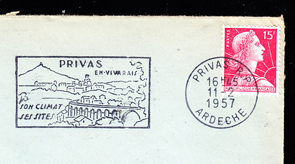 68898 OBL FRANCE (1953) Pont-du-Gard bridge over Gardon river at Remoulins. Nice pictorial cancel on envelope. 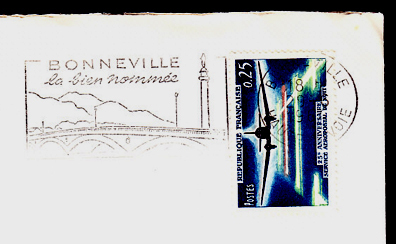 68899 OBL FRANCE (1953) Bridge over Arve river at Bonneville. Nice pictorial cancel on envelope. 76135 OBL GERMANY (1953) Bridge*. Cancelation for Dusseldorf Trade Fair. 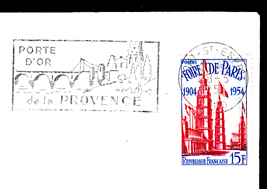 68883 OBL FRANCE (1954) Bridge over Rhone river at Pont-St.-Esprit. 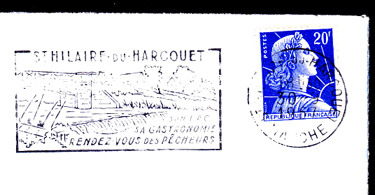 Nice pictorial cancel on envelope. 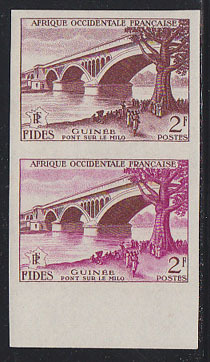 71238 ESS FRENCH WEST AFRICA (1956) Milo bridge*. Trial color proof pair. FIDES issue. Scott No 66, Yvert No 55. 71240 ESS FRENCH WEST AFRICA (1956) Bridge* across Sansanding River*. Native woman*. Trial color proof. FIDES issue. Scott No 70, Yvert No 59. 68881 OBL FRANCE (1957) Bridge over Ouvèze river at Privas. Nice pictorial cancel on envelope. 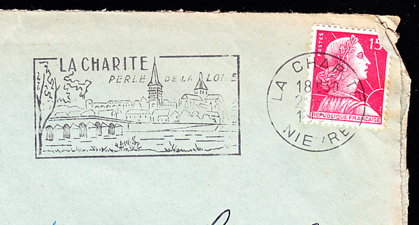 68889 OBL FRANCE (1957) Bridge over Loire river at La Charite. Nice pictorial cancel on envelope. 68890 OBL FRANCE (1957) Bridge over Sélune river at St.-Hilaire-du-Harcouet. Nice pictorial cancel on envelope. 68891 OBL FRANCE (1958) Bridge over Lignon du Valey river at Tence. Nice pictorial cancel on envelope. 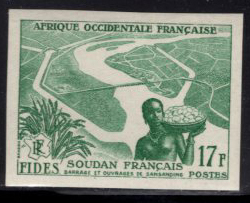 71244 ESS FRENCH WEST AFRICA (1958) Abidjan bridge. Trial color proof. Scott No 77, Yvert No 65. 68893 OBL FRANCE (1959) Bridge over Meuse river at Fumay. Nice pictorial cancel on envelope. 68876 OBL FRANCE (1960) Bridge over Mayenne river at Espalion. Nice pictorial cancel on envelope. 54848 SPE JAPAN (1960) Mikawa Bay National Park*. MIHON (specimen) overprint. Scott No 691. 71354 ND MADAGASCAR (1960) Mandrare bridge*. Imperforate. Scott No C66, Yvert No PA83. 68877 OBL FRANCE (1961) Bridge on Corniche des Cévennes. Nice pictorial cancel on envelope. 68884 OBL FRANCE (1961) Aqueduct in Morez, Vallée de la Bienne. 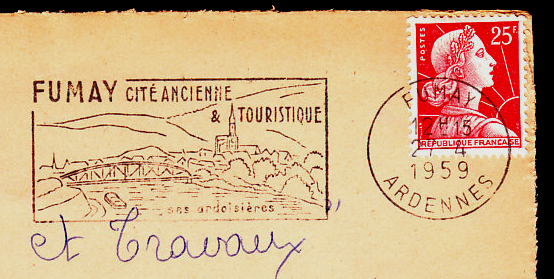 Nice pictorial cancel on envelope.